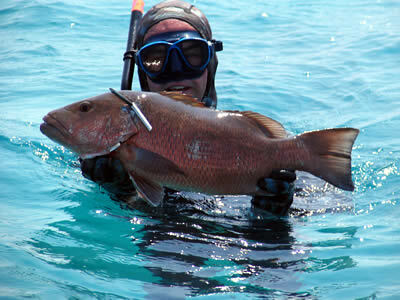 Florida Keys spearfishing is done mostly in the lower and middle Keys. That’s because John Pennekamp State Park in Key Largo is a protected zone where no spearfishing is allowed. That’s too bad, because Key Largo has the clearest water of all the Florida Keys. It’s a very popular destination for scuba divers but spearos have to keep on driving down the Keys to get to spearfishing grounds. 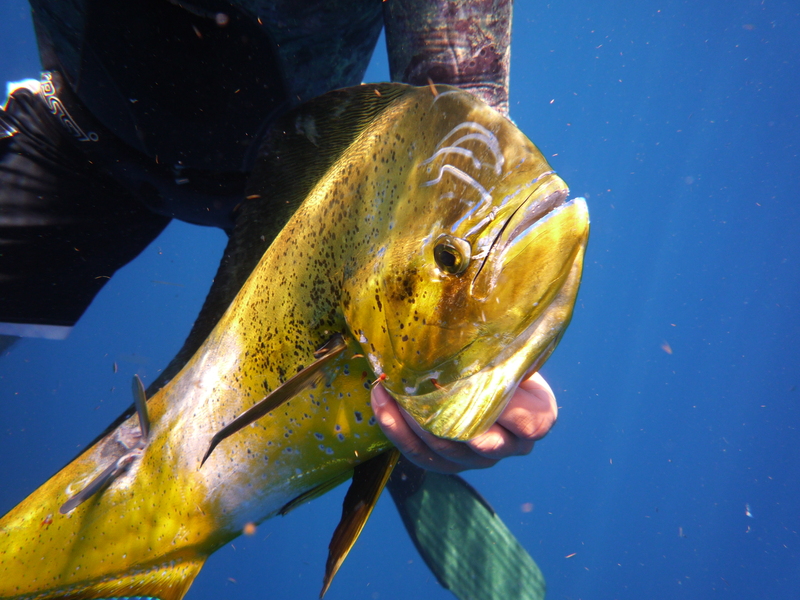 Another thing to know before you go is that unlike other parts of Florida where the dropoff can be quite close to shore, Florida Keys spearfishingusually requires a boat. The reef is at least six miles out in the Keys, and the dropoff is beyond that so unless you plan on spearfishing in ten to twelve feet of water on a few patch reefs for hogfish, plan on getting your hands on a boat even if it’s a small one. Spearing fish on the reef is always fun, especially if you’re not an advanced diver. With a little practice, freedivers can get down to twenty feet and much of the coral reef is at depths of ten to fifty feet. Of course the deeper you go the bigger the fish, but there are some pretty good (meaning “legal”) red grouper out there in twenty to thirty feet. Plenty of rocks to search under. AJs will swing by, as well as bar jacks sometimes big enough for eating. In winter look for cero mackerel, in depths as low as twenty to thirty feet. And of course there are always lots and lots of snapper hanging around the rocks on the bottom. Florida Keys spearfishing is regulated, just like fishing and by the same folks at the Fish & Wildlife division of the State of Florida. The same size and bag limits apply as for fishing, and you must have a fishing license. You must put up a dive flag when you’re down and you cannot spear fish inside the Sanctuary Preservation Areas. The sanctuaries are marked by large yellow bouys so keep an eye out when choosing your spots. If you’re visiting on vacation and plan on doing a little Florida Keys spearfishing, then you might want to know where you can find some local dive shops. Key West has probably the most to offer, with a Diver’s Direct, Sub Tropic on North Roosevelt, and a small offering at a dive shop on North Roosevelt near the Sears Plaza. Diver’s Direct is the largest. It’s located on Simonton just off Duval Street. They have a few reserved parking spots on front of the store, too. Find Riffe bands and other brands too. Find Omer, Riffe and Sea Hornet spearguns. Find spare parts for spears, dive bouys, snorkels, masks, wetsuits and fins too. For those who spearfish with scuba gear, find your gear here as well. 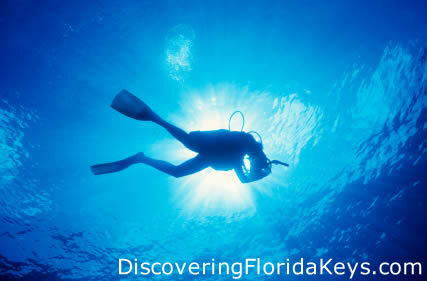 There’s also a Diver’s Direct in Key Largo for snorkel and scuba gear. Since you can’t spear in Key Largo, spearfishing gear is limited. If you’re in the Middle Keys, one of the best dive shops is the Looe Key Dive Shop, between Key West and Marathon. If you need help or guidance with gear, this is your best bet in the lower Keys. You can’t spearfish Looe Key but you can go out beyond it and of course in the direction of Marathon it’s not protected. More information on Spearfishing Charters. Miles and miles of coral reef, dozens of explorable shipwrecks, and plenty of marine life to observe…what’s not to love about Key West diving? We’re blessed with North America’s only living coral reef and the abundancy of sea life that exists around this incredible ecosystem. Key West diving makes this tiny island a true paradise, if you ask any diver! And now, Key West diving is even more exciting because there’s the newest artificial reef, the USS Vandenberg. 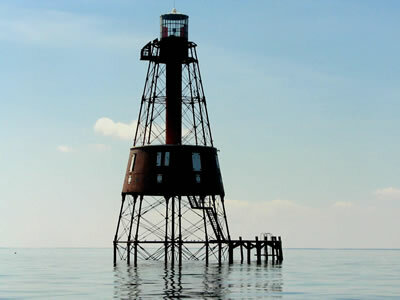 Sunk in May 2009, this 327 foot ship sits in 130 feet of water six miles south of Key West. All the dive companies in town now feature Vandenberg dive trips – book online for better deals and discounts. If you’re new to diving, then you can opt for a resort course. Learn the basics of diving in a day, and you can be out on the reef exploring the amazing underwater world in no time! The marine world and its incredibly beautiful creatures are not to be missed – imagine yourself on vacation in Key West, exploring a whole new world! Sea turtles, rays, schools of tropical fish, curious and harmless barracuda, eels, and the occasional pelagic fish like mackerel will make appearances on the reef or wrecks frequented by Key West diving boats. From complete beginners to advanced technical divers, Key West diving has something for everyone. Some of the shipwrecks are in deep water with strong currents, like the Curb Wreck. Curb is 180 feet down, so only advanced divers can attempt this wreck. The Vandenberg is also deep, but even if you can’t go that deep, you can still enjoy this new artificial reef. The satellite towers come up to 50 feet from the surface so even snorkelers can see them when the visibility is good. Why miss out on one of the best things about the Southernmost City? Key West diving is one of the top ten activities here, and it’s accessible to almost anyone who wants to try. From resort courses for novices to advanced technical dives for those of you who’ve been diving for years, we have a dive package for you. Come and witness the beauty of the underwater world of Key West and rediscover how exciting your vacation can be! 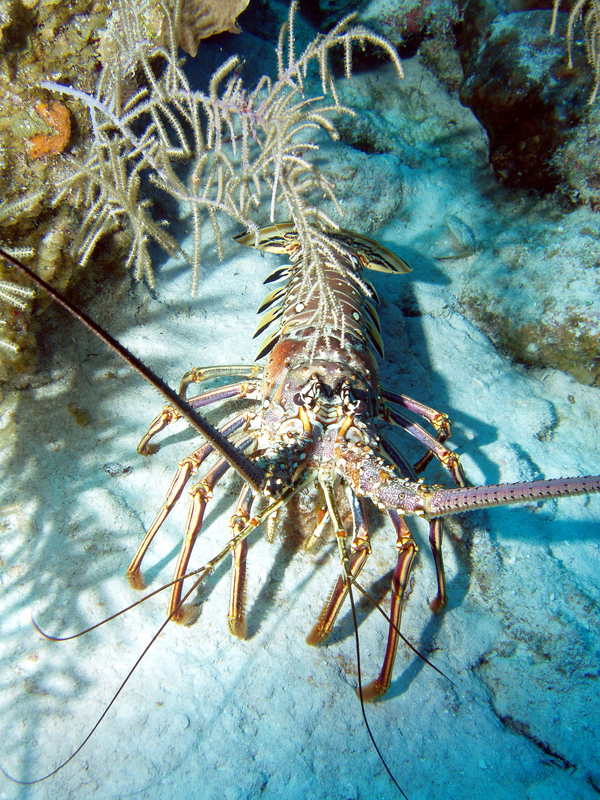 Scuba diving Key Largo is at the top of every serious diver’s to-do list. The Florida Keys area is well known for its ocean-based activities, with snorkeling and scuba diving Key Largo being no exception. One of the best places in the world to do this is in Key Largo itself. Key Largo is the first and largest isle in the Florida Keys. It is also well known for its undersea activities, including diving and snorkeling, and was one of the first places in the world to begin conservation efforts. In 1960, the John Pennekamp Coral Reef State Park was created as the first undersea preserve in the United States. That’s why today we can boast that scuba diving Key Largo the top reason travelers come to this area of the Keys. Key Largo has continued with conservation efforts, with the 1975 designation of the Key Largo National Marine Sanctuary, and is now home to six Sanctury Preservation Areas as part of the 2800 square nautical mile Florida Keys National Marine Sanctuary. Key Largo is well known for its shallow reefs, which offer world class scuba diving and is ideal for both beginners and experienced divers. There are also many deep wrecks which provide excellent exploration opportunities for scuba diving Key Largo. One of the Florida Key’s most popular snorkeling and diving spots is the Statuue of Christ of the Abyss, also known as “Christ of the Deep”. This 9 foot high bronze statue by Guido Galletti was placed as a memorial shrine to sailors and others lost at sea. This shallow spot, located at Key Largo Dry Rocks, is ideal for up close viewing of a wide variety of fish and undersea life. Other popular reefs near Key Largo include Molasses Reef and French Reef, both known for the wide variety of sea creatures and fish species. Molasses Reef is often referred to as the most popular diving location in the world. The reef is as high as the ocean surface and reaches a depth of fifty-five feet on a gentle slope. Visibility is excellent due to the gulf stream. There are also many wrecks which this area of the Florida Keys is famous for, offering world class diving for all skill levels. Key Largo has some of the best opportunities for exploring shipwrecks. Bibb and Duane are both 327 foot US Coast Guard cuttters, which were sunk in 1987 in the area known as The Elbow Reef. They rest in 130 feet of water, Duane in an upright position while the Bibb rests on its starboard side. The City of Washington is among several historic shipwrecks in the area. The Elbow Reef is a mile south of Molasses Reef. Benwood Wreck is a Norwegian freighter that sank during the Second World War near French Reef. It is quite shallow, and attracts many divers for night dives. French Reef also offers some fantastic coral caves and swim throughs, with excellent opportunities to see sea life. Most recently, Key Largo added the 510 foot USS Spiegel Grove in June 2002 as an artificial reef, at the cost of over one million dollars. The Navy transport ship is the largest ever sunk as an artificial reef, is at a depth of 130 feet and resting on its starboard side. The USS Spiegel Grove is located near Key Largo’s Dixie Shoals.